The novel’s lovable, intricate characters and the challenges that they face every day, from protecting their lands to safeguarding their hearts, are an irresistible draw. 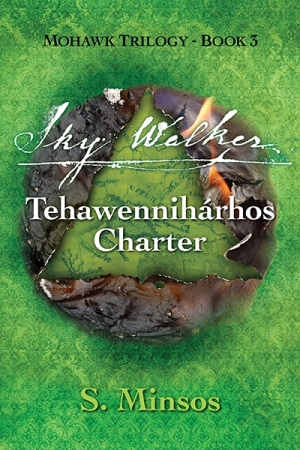 The satisfying third and final book in S. Minsos’s historical trilogy, Sky Walker Tehawennihárhos Charter follows the nineteenth-century disruption to Indigenous lands caused by European and American settlers. As a young Mohawk in what is now known as Ontario, Squire Tehawennihárhos Davis—along with his cohorts, Scotchwoman Jennet Ferguson and Jeddah Golden, a man of mixed lineage from Appalachia—is tasked with coming into his own, both emotionally and financially, as the bankruptcy of the Grand River Navigation Company threatens his reality. The book comes with enough of an introduction and overview of the rest of the series so that it can stand on its own. Despite being set over a century ago, the book tackles the intricacies of gender inequality and relationship issues in a relatable manner, tying the struggles of its characters to contemporary issues. Subplots of drama and romance add a coming-of-age element to the historical tale. Rich, vivid descriptions employ all the senses; they are one of the strongest aspects of the novel. A root is described as “as thick as a slinking python”; “a makeshift but colourfully patched tent … with a yellow sock-flag waving on the pole at the tent’s peak” appears at a fair. These details enrich the story and help build a world that’s undeniably intoxicating. Another highlight comes in the minor characters, who are brought to life in a multidimensional way that makes the Sky Walker Tehawennihárhos Charter universe immersive and realistic. All characters leave a lasting impression, even those as tertiary as Miles Finlen, the tall, gruff barkeep who works tirelessly to maintain respect for his bar while throwing out bums and serving patrons. Like many characters that could be written off as ancillary, in his few scenes Miles is instead presented as an integral spoke in the wheels of the trilogy. The complexities of the era are thoroughly researched and accurately imparted, as evidenced by the detail in both the book and its lengthy introduction. These historical trials are never intrusive in the text; they are always incorporated in a relatable way. The novel’s lovable, intricate characters and the challenges that they face every day, from protecting their lands to safeguarding their hearts, are an irresistible draw. Minsos concludes a three-part saga with Sky Walker Tehawennihárhos Charter, a satisfying narrative that weaves all characters and story lines together.